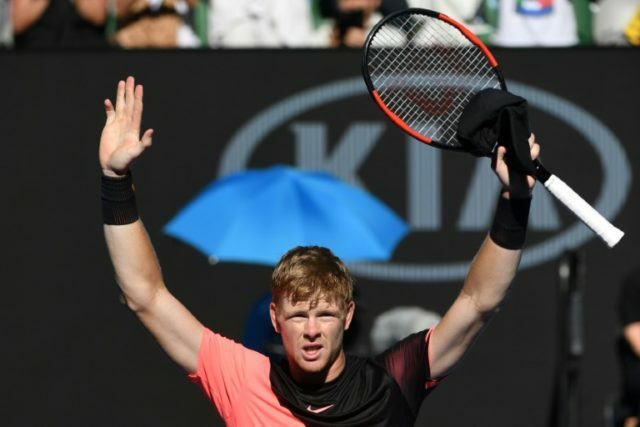 Melbourne (AFP) – Unseeded Kyle Edmund and Elise Mertens pulled off huge upsets to march into uncharted territory at the Australian Open Tuesday as they swept into the semi-finals. British star Edmund stunned third seed Grigor Dimitrov 6-4, 3-6, 6-3, 6-4 on Rod Laver Arena to set up last-four clash with either world number one Rafael Nadal or former US Open champion Marin Cilic, who play later. Mertens, who is yet to drop a set, was equally convincing in blasting past world number four Elina Svitolina 6-4, 6-0 to become the first Belgian to get so far since Kim Clijsters in 2012. Her win sets up a battle to reach the final with either second seeded Dane Caroline Wozniacki or veteran Spaniard Carla Suarez Navarro. Bulgaria’s Dimitrov had beaten Edmund only two weeks ago in the quarter-finals at the Brisbane International, but there was no repeat. “It’s an amazing feeling. I’m very happy,” said an overwhelmed Edmund, ranked 49 and in his first semi-final at a major. The 23-year-old is the only British man in the draw after Andy Murray’s injury withdrawal before the tournament, raising the prospect that it will be him, rather than the Scot, who breaks through to win in Australia. Murray has been a five-time finalist, but lost them all. World number 37 Mertens is on a hot streak of form, unbeaten in 10 matches after winning in Hobart this month. She was too physical for Svitolina as she stormed into the semis, incredibly on her Australian Open debut. “It’s amazing. I mean, it was not expected, especially today. Really tough match,” said the Belgian world number 37. Svitolina blamed a hip injury for her shock ousting as she again failed to get to the last four of a Grand Slam on her 22nd attempt. “It was my hip. I started to feel it actually after the final in Brisbane,” she said, referring to the warm-up tournament she won. She needed a run to the final to have a chance of displacing Simona Halep at the top of the world rankings. Romania’s Halep plays her quarter-final against sixth seed Karolina Pliskova on Wednesday. Big-hitting Marin Cilic stands in the way of a second successive Australian Open semi for Nadal, with those two headlining Rod Laver Arena later. The top seeded Spaniard has been in ominous form up till now but faces a high hurdle in the sixth-seeded Croat. Nadal, who lost to Roger Federer in last year’s final, has a 5-1 career win record against him, but is taking nothing for granted. “I know I’m going to have a tough opponent with Cilic. I need to play aggressive and play well,” said the 16-time Grand Slam champion, who has only won once in Australia, in 2009. Dane Wozniacki, who follows them onto centre court in the evening, last made the semi-finals at Melbourne Park in 2011 as she continues her search for a maiden Grand Slam title. She faces a familiar foe in Suarez Navarro, whose two wins in seven career meetings with her were both on clay. “Obviously hard courts are a little different,” said Wozniacki.